July 30, 2018 and we are nearing the Azores. The goal was to make it there in around 18 days, and at this point we are 5 days over that mark. This might seem like an issue to someone who is adhering to a strict schedule, but that is not us! The winds got a little light so we turned North a bit until they got stronger, then we continued sailing East towards the Azores. According to our friends who have now made it to Flores and our friends who are in the United States with weather routing programs on their computers, they have been telling us that the ideal turning waypoint is coming up. I plotted it on our screen with a sign post because I thought it was cute and it gave me something to do. I also added another lighthouse down on Ponta Delgada of Sao Miguel. Why? Because it is a harbor that I have studied and if we miss Horta, we can try for Angra, and if we miss Angra, we can try for Ponta Delgada. Why have so many backups? Because having backups means we don’t stress out if we miss our goal. Imagine you are in a race and someone holds out a cup of water. It is a long race and this is the only cup of water that you will be offered to you. You are probably going to be really focused on that single cup of water. Everything else is unimportant and all your attention goes into reaching and obtaining that water. That’s a lot of pressure to grab that single cup of water! How about this situation for perspective: same race, but a long line of people holding out cups of water. If you miss one, simply re-aim for the next cup and grab that one. Easy! That’s what I did here. I marked all the cups and created a long line of them for us to grab. We still have our ideal cup, but we can grab any of the other cups if we miss. The clouds start talking today too. Up ahead on our starboard side, the sky is completely clear (high pressure). To our Port side, you can see clouds rolling in (approaching low pressure). Way out in the distance, directly to our Starboard beam, you can see reddish skies. This is very visible with polarized lenses, and tells you that you are looking at a high pressure system in the distance. The higher air pressure refracts light differently and shifts it towards the red side of the spectrum. Just by looking at it, you can see that there is a High to Starboard and you know that means no wind over there. As the day continues on, the low from the Port side begins to roll in further and is now visible on the starboard side. This is how we make sure to stay in the wind. A low pressure system will have winds rotating in a counter clockwise manner, so being on the lower right side of the system means we will be having winds blowing from behind us! Basically, we can expect to be on a Broad Reach on Port Tack tomorrow (when the system comes in all the way), just by looking at the clouds! As the day drags on, the low pressure continues to roll in. Low pressure systems are great because the winds come on gradually. This means that you don’t have to reef right away when you see them because you aren’t going to get smashed by a wall of wind in two days. Instead, the winds will simply continue to build gradually and you can go reefing accordingly. We are nearing the end of July, and also nearing the Azores. Soon we will need to turn South towards the island chain and enter the Azores High, an area plagued by light winds and currents. Normally, cruisers will sail across the Atlantic and then motor the last few days once they lose all wind as they enter the High. We don’t have that luxury, which is why we carry a suit of light air sails. I had these sails (a drifter and a light air mainsail) made out of ripstop nylon (spinnaker material) just so that we would be able to sail once we entered the High ourselves. The closer we can get to the islands without entering the High, the longer we can sail for. To complicate matters further, the Gulf Stream flows through here, so wind or no wind, there is a strong current carrying you to the East. If you miss your island, you might have some trouble sailing back to it against the current with no wind! Our Australian friends were able to receive this information from Predict Wind, but we weren’t able to see it while we were still sailing. They just gave us a brief version in 160 character text messages to our satellite phone. When we did finally meet up in Horta, they gave me all of these screen shots that he had taken of the weather reports. The forecast is processed by Predict Wind and run through four models. You have the US model, Predict Wind’s version of the US model, the European model, and Predict Wind’s version of the European Model. The information is broken down into various categories and based on the performance of your boat or the conditions you are looking for, you can choose the route that you think will work best. It gets interesting when you throw islands into the mix. Some of the models are saying to go North of Corvo, others are saying to go between Flores and Corvo, and others are saying to go South of Flores. As you approach Faial, the red model is saying to drop south of Faial and come back up to it, while the green model is saying to go North of Faial and then approach Horta from the East side of the island. The same information goes in, and yet all four models say something completely different. Out in the ocean, it doesn’t really matter where you go because there is just plain old ocean everywhere. When you throw islands into the mix, you now have wind shadows to contend with and you have to wonder: are these wind shadows accounted for? We had another bright moon light night to show us that the wind and waves were plenty and strong. We continue to sail East, waiting for the signal in the sky to tell us to turn Southward towards Faial. We continue to make our way East but we have removed the Northern component of our course. Why? We have enough wind! The winds in the Westerlies are pretty easy to navigate and sail in because you can choose what kind of winds you want to be having. The further North you go, the stronger the winds will be. The further South you go, the lighter the winds will be. If you feel that the winds are a bit light, simply sail a bit more northerly until the winds build to your liking. If you feel they are a bit too strong, simply head a bit more southerly. When you finally find the winds you like, just head East and the winds will stay constant for you! While stronger winds do mean larger seas, when they are following seas, they are not so bad! The waves come at your stern and simply slide under the overhang. The stern lifts and you surf down the wave. As the wave passes the boat, the bow goes up and the boat would normally lose its speed as it tries to climb the back of the wave, but the winds are strong and won’t let you decelerate, powering you along as you ride through the seas. As night falls, the stars begin to come out. This one star, probably Venus or Jupiter, is already out even before the sun has sunken beneath the horizon. We always reef down in weather like this, not because we want to go slower, but because we don’t want to be reefing in the dark. Should the winds build further, we would be over-canvassed and over-powered, necessitating us to deal with tanbark sails in the dark. Reefing early means that the person on watch simply watches and the person off watch sleeps. Nothing dramatic happens and everyone stays safely well rested. 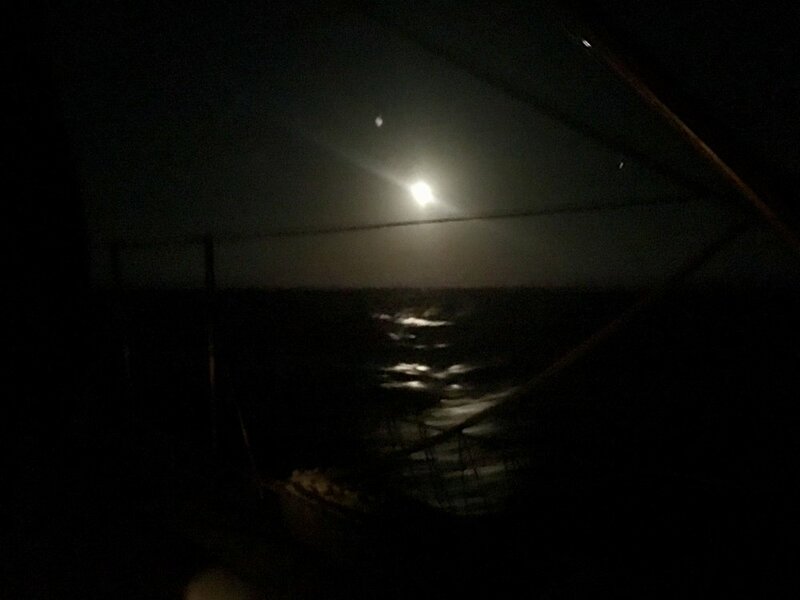 Thankfully, the Moon is well light in the night as we are making our way towards the Azores. I always prefer to sail at night with a full moon. It makes the mystery of the darkness wash away as your eyes adjust to the small amount of sunlight being reflected back at the surface of the Earth. It is also very useful to judge the sea state as the moon beam lights up the tops of the waves on its way to your yacht. In your perspective, it might look like a single beam of light leading up to the moon, but everyone has this same perspective as the light from the moon is radiating out evenly in all directions and you are only able to perceive the light that is coming your way; just as someone else can only perceive the light coming their way. Imagine if we could all see the world from other peoples perspectives? I’m sure there would be a lot less conflict! July 27, 2018 and we are approaching the turning point to head back down to the Azores. 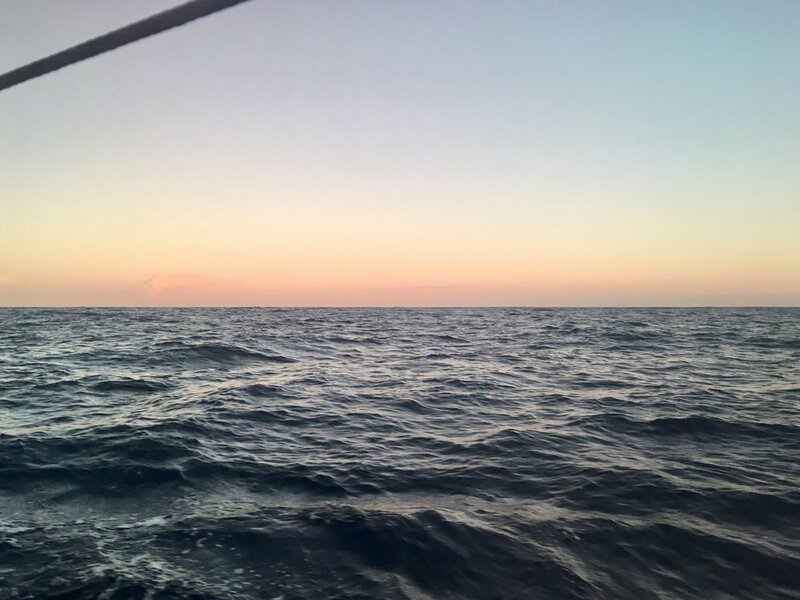 It has been 20 days at sea with no sight of land, and if we continue on our current course, we will miss the Azores entirely! We need to turn south, but if we do so too soon, we will get caught in the high again. Too late and we will end up sailing extra miles as we fight the Gulf Stream that is running Easterly in this region of the world. Being bored on the boat, I played with the little icons again. The windmill is the waypoint that some of Australian friends said would be good wind and the walking man was a waypoint that a friend on shore in the United States said would be a good waypoint for wind. They are both close, but the interesting thing is they are not the same points, even though they were both using Predict Wind to get this information. Makes me wonder if the program gives reliable information or if the different users were simply inputting different information? The first light house is Flores, the next point, a tree, is Faial (our destination) and the third light house is Terceira. Our Australian friends are currently in Flores and enjoying the wonders of being on land again. We want to check in at Flores to experience the classic “Azores Check-in” and then we have a friend on Terceira that we want to visit once we are checked into the island chain. As promised, the winds returned. Our little break from sailing was much needed as we were a bit tired from all the watching and movement of the boat. Just the act of sitting in a sailing vessel is strenuous as you are constantly moving your core to maintain yourself straight and steady. Sleep is not as deep because you are listening for the on watch person should they call out for you to assist them. Having a break in the middle was actually really nice because it let us recharge and regroup. We ate, we rested, and now we were ready to go once again. With the winds back, we were moving along quickly at our old pace, covering more than 100 nautical miles per day. Friends on shore were giving us coordinates for where the wind is located, and we had plenty of time to play with the symbols on the screen. The skull and crossbones is the location of a Hurricane, the windmill is the waypoint where the wind is located (based on weather routing software), the little boat is our Australian friends who left Bermuda a few days before we did and were a few hundred miles ahead of us as a result. This little map is the closest thing we have to an electronic chart of where we had been and where we are going. You can see the marks as we traveled down the coast of the United States, some of the points off of Georgia were “far out to sea” in our opinion at the moment. Now when we look at this map and see how we just rocketed away from the shore and shot straight out to sea, we begin to wonder what we were thinking. What changed in our minds that let us point directly away from land and head straight out towards an empty horizon? We have charts and know that land is out there, but what about the first explorers who were setting out blindly? They had no idea what or where land was located, and simply ventured out over the horizon to lands unknown. With all this knowledge, we were still scared to actually let go of land and head out to sea. Now we are out in the middle and not even thinking about looking back. We are cruisers and we are crossing the ocean; the best way to do that is to head straight towards your destination!